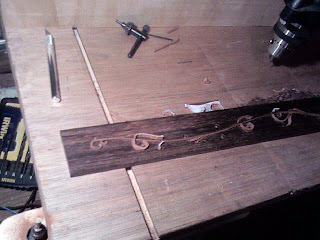 Decided to try and tackle the fret board inlay this weekend. 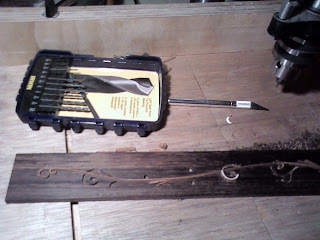 Started by printing out the pattern – to scale and spray-mounting the image on the ebony. 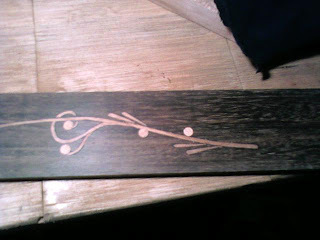 I then traced the entire design with an exacto knife, very deep cut. 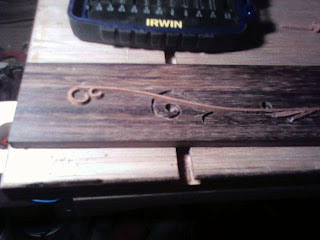 Then I started routing the board out. 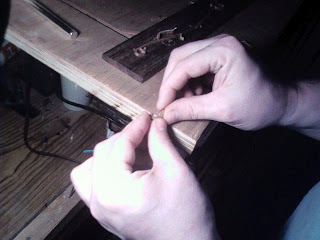 When the entire board was routed, I cleaned up any rough spots with and exacto again. 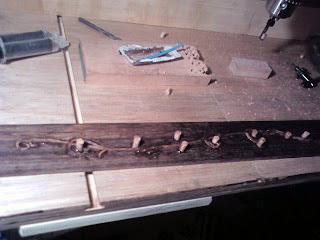 Then started laying the inlay in this board. I decided against cherry and choose mahogany instead. I thought there was just too much contrast with the cherry and like the fact that the bottom of the neck is made from the same wood. 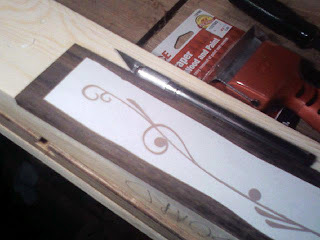 To do the detail work I needed to make a almost zero clearance for my scroll saw. So the small pieces don't fall through. this worked great. 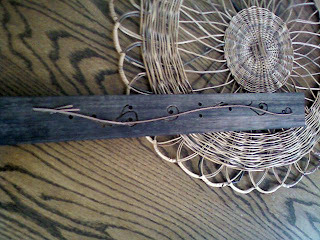 As you can see the curved pieces are very small. Maybe the size of a dime... or smaller. 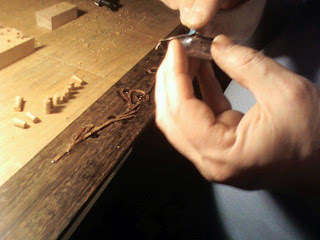 More pieces cut out an placed. 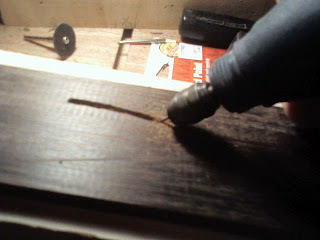 Sanding the small pieces on the dremel with a sander attachment. VERY tiny little curves. 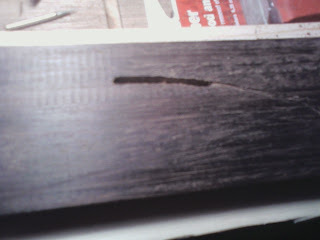 I probably broke about six pieces while sanding... Back to the scroll saw. 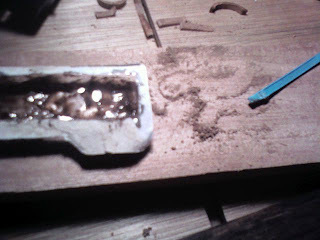 Mixing up 5 min epoxy with saw dust. 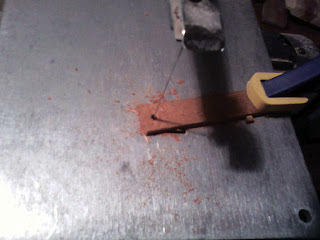 I actually took the saw dust and rubbed it on 120 grit sandpaper to get it very fine. This seemed to work well. Gluing it all in. You can see my quarter inch plugs in the background. 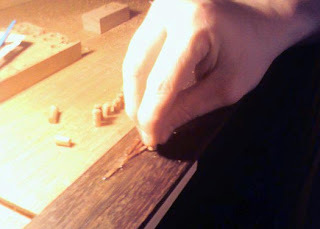 Putting the plugs in the holes. This will help me to know where the 3rd, 5th, 7th, 9th, and 12th 15th and 17th frets are visually while I'm playing. All the plugs glued in. 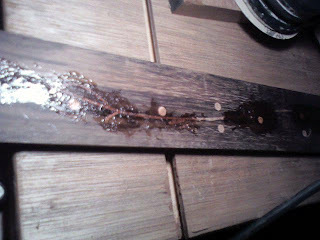 Once dry I sanded it all down then applied another coating of epoxy and dust to fill any gaps. 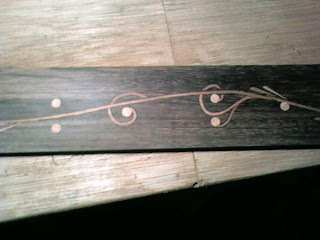 Finished inlay! I took this in three separate shots to show the detail. 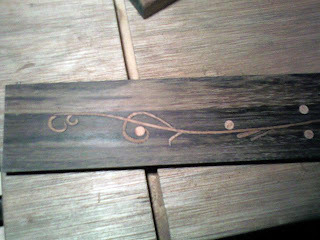 For my first inlay I'm very happy with how well it turned out. 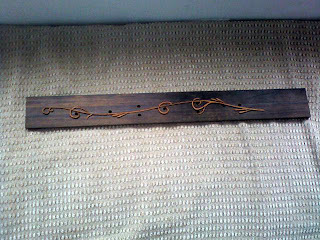 It's far from perfect, but I think I learned a lot and will be better when I do the headstock inlay and the rosette sound-hole inlay. Very exciting for me to accomplish this task!